I am a huge American Idol fan this season. And Lee DeWyze and Crystal Bowersox were my two favorites from the very beginning. Lee is from a suburban town just up the street from where I live, which was probably my initial reason rooting for him at the start. As some of you know my DH was in the hospital last month and I noticed that all the nurses were wearing buttons which said, "I voted for Lee DeWyze." Of course that was an immediate conversation starter and I found out that Lee's mom Kathy works at the hospital and the buttons were being sold to raise money for her to fly out to California every week for his performances on the show. I also learned that Crystal is a distant relative of Dr. Keith Bowersox, who happens to be on staff at the same hospital. Small world, huh? The morning of my husband's surgery, one of the nurses came in to do an EEG scan (sort of like an EKG for your brain) in which my husband was told to lie completely still and not talk or make any facial movements. As he was lying there having the test done, the nurse and I started talking about American Idol and we went on and on about it. I couldn't believe that my husband could keep a straight face during our silly conversation. But eventually he did succumb and cracked a little smile, which the nurse saw and had to make a notation on the scan so the doctors would know it was his smile, and not his brain, making the test go hay-wire. If you don't watch American Idol and don't know who Lee and Crystal are, click on the video below to hear a duet the two of them sang on Tuesday night. Next Tuesday will be the the show where they film the contestants going back to visit their home town. All the nurses at the hospital are hoping AI will do a segment at the hospital. Is it Mt Comfort PA? How exciting for ya all!! loved it- lee is pretty darn cute. I was a david cook fan when the davids battled it out- my lulu was the david archeleta fan- so wish i could sing like that! i apologize -- i kept thinking -- when will jeanne have a new post? i thought i had you on my roll but i didn't. i just fixed that. i'm so sorry about all of the news i have missed, especially about your husband. i hope everything is okay. i hope to have a blog catch up night again soon! this post was a great read! I am always amazed at how small the world is! Cool story. Those two are my favorites and I just can't decide which I like better! Arent the two of them freaken awesome! I love Crystal most, but lee is a very close second. Did you buy a button to help lees mom get to see him? I cant imagine how exciting it must be for the parents and family of the contestants! Thanx for a lovely blog with lots of inspiration! 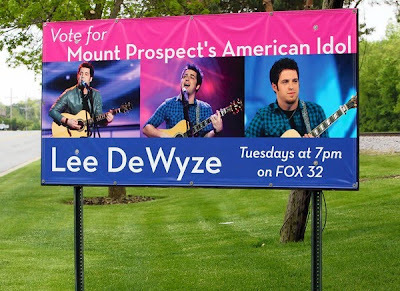 Lee is by far my favorite of the American Idol contestants. I try not to get sucked into American Idol or any of the "reality TV" out there, but this season I did and I really like Lee.